George Burns was a legendary comedian and actor and arguably the greatest straight man of the 20th century. He started his career in vaudeville, and later made a successful transition to film, radio and television, when he formed the Burns and Allen duo with talented comedian and future wife, Gracie Allen. His arched eyebrow and his cigar smoking became his trademarks in an illustrious career that spanned over three-quarters of a century. With his passing at the age of 100 in 1996, George Burns solidified himself as one of the grand old men of American show business. 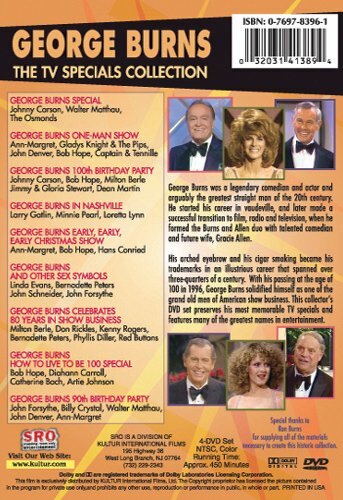 This collector's DVD set preserves his most memorable TV specials - never before available on DVD or VHS - and features many of the greatest names in entertainment. This is a 4 DVD set! 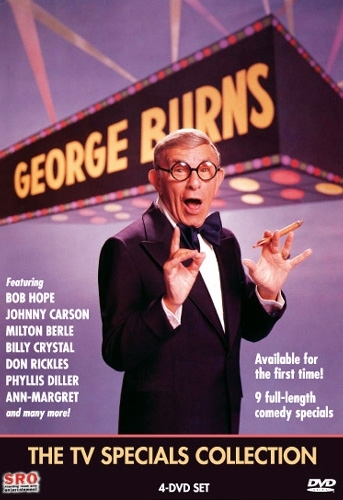 "This is George Burns, the master monologist, and George Burns: The TV Specials Collection does give you a chance to see him in his prime." "If you’re in the mood for some lighthearted television...pop this in, kick back, relax and remember the good old days when George could still light up a cigar on stage and throw out a long-running punchline that got funnier every time he said it."